This month so far we have been learning about Easter in RE. We have acted out the Easter story and explored how religious people relate to these events. In computing, we created animations for the volcanic eruption of Mount Vesuvius. We also had science week where we conducted experiments to see how to make the most bubbles. In February, we did persuasive writing where we persuaded tourists to visit Italy. We also explored mosaics and mosaic artists such as Alison Hepburn. Next month, we will be making mosaics out of tiles. In January, we began our Italy topic. We started by exploring the location and doing map work. We also looked at different types of rocks in science such as igneous and metamorphic rock. We classified these and identified the process of how we get them. We have also been exploring computer programming in our computing this month and have been looking at using algorithms. We used an online Logo program to do this. In our design technology lessons, we have been conducting market research ready to make our chocolate treats to sell at the Christmas markets. Welcome to year 3B! I have been very excited all summer to begin our wonderful first topic which is all about chocolate! Both myself and Mrs Wood have been busy organising lots of fun activities that I KNOW you will all love. I have heard that you are a wonderful class and I'm looking forward to seeing how hard you work. Whilst you are off, please have a think of some high-5 activities that we could do over the first term. Remember, high-5 consists of: punctuality, attendance, uniform/ PE kit, homework and reading. Just a reminder that our PE days are Wednesday and Thursday. Love and best wishes, Miss Hicks. This month, we have had a fantastic all around the world day! Our country was Mexico. We hit pinatas and lots of sweets and toys fell out! We also explored the day of the dead celebration and made sugar skulls. Another thing that we really enjoyed was making pizzas in our Italy topic. We conducted market research to find out people's favourite flavours. We then designed and made our own. We have had a cool February with all of the ice and snow! We have enjoyed learning all about Italy and in science, we have been learning about magnets. We conducted an experiment to see which type of magnet was the strongest. For our Italy topic, we will be making pizzas. To do this, we firstly tasted the Italian ingredients such as olives, peppers and garlic. In maths, we have mastered division and subtraction. We can now use our knowledge to solve reasoning problems. This month we have explored our Italy topic. We began by looking at the Romans. We were lucky enough to go to Roman Ribchester museum because this was a Roman site. We saw ruins of the granaries and the Roman bath house. We also got to hold artefacts and wear Roman armour and hold Roman weapons. We also enjoyed our Winter Wonderland day where we went iceskating, had snowball fights and met real reindeers. December has been a very exciting month! We wrote letters to Father Christmas, telling him how we have behaved this year and asking him for some Christmas presents. We also created winter pictures by mixing paints. To accompany this, we wrote winter poems. We had lots of creative fun making Christmas cards and calendars for our loved ones and thoroughly enjoyed watching the pantomime and nativity. We also went on a trip to church where we learnt all about advent and what this means. In class, we then learnt all about Christingle and what the different objects represent. We then used tangerines, candles, sweets and cocktail sticks to make our own Christingle candles. In year 3b, we have made lots of progress across our subjects this term, especially in writing, spelling and grammar! We look forward to learning lots of new, challenging and exciting things in the new year. In English, we have learnt all about dragons! We EVEN saw a video clip of a real dragon flying over our school! In science, we have learnt all about rocks. We can classify three different types of rocks, metamorphic, igneous and sedimentary. In history, we have learnt all about The Stone Age and where this period of time comes on time lines. We now know abut how they used tools and developed over time. This month we have had an Olympic Day in KS2. We were split into 5 different teams and decorated flags to represent our teams: England, Scotland, Wales, Northern Ireland and the Republic of Ireland. Our day started with an opening ceremony where we gathered in our teams and cheered as loud as we could! We discussed the values of the Olympic games and the importance of trying our best, working collaboratively and supporting our team members too. We took part in four different activities throughout the day. The first was the long jump - we got points based on how far we could jump! Then we sprinted as fast as we could along the running track. The winner got 5 points for their team. We then transferred our sprinting skills into a team relay race - the teams that won the relays were England and Wales. After lunch we tried our hand at archery. This was new for most people in the class and took lots of concentration, listening and of course a perfect aim! We had to try and land our arrows in the centre of the target board and collected lots of points for our teams. Finally our last activity was a game that was unfamiliar to everyone. It was called 'goal ball'. Player were blindfolded as it is usually played by those who are visually impaired. It was played with a special ball that had a bell inside of it. We had to listen carefully to where the ball was bowled by the other team and try to save it! It was very tricky but some people had exceptional hearing and other senses and managed to save lots of goals. What a fun, exciting day we had! The children talked about how they had enjoyed trying out lots of new sports and that they enjoyed competing against each other too. This month we were lucky enough to have a visit from Warburtons bakery in our classroom. Ruth from Warburtons told us lots of interesting information about the factory and company. Did you know that Warburtons' first factory to make bread was in Bolton? You can still smell the delicious bread there today! Their most popular product is their toastie loaf. Miss Hindley buys that one at home for her toast too. Did you know that the factory makes 10,000 toastie loaves every day? It is only shut one day a year too - Christmas Day. Every other day it is open 24 hours with people working shifts through the night. As well as finding out about the different roles that people had in the factory; we also looked at healthy diets. We looked at the eatwell plate and found out that we need to eat: protein to help our bodies grow strong and healthy, dairy products to help us have healthy teeth and bones, and carbohydrates with every meal. Carbohydrates are things like bread, pasta, potatoes and rice. They fill you up and give you the energy you need to work and play. Lots of us knew that we needed to try to eat 5 different types of fruits and vegetables every day so that we had lots of vitamins and minerals. We got the chance to try lots of different ingredients like celery, peppers, olives, lettuce, tomatoes and cucumber then to see which ones we liked the best. Once we had tried the ingredients it was time to make our sandwiches, but not before our hygiene check! It is important that we keep germs away from our food especially in a factory! We needed to wash our hands, roll up our sleeves and even wear an apron and a hair net! Once we were prepared we made our delicious sandwiches on Warburtons' sandwich thins. We put ham, chicken and/or cheese on our sandwiches and remembered to add a rainbow selection of vegetables too to make sure we got our 5 a day vitamins! They were delicious and we ate them ALL up! We found out that as a country we waste lots of food each year and decided that we need to try to do our best to reduce this! We decided it was a good idea to try to always eat all the food on our plates so it doesn't go in the bin. We also brought home some tasty recipes to try making with left over ingredients - pizzas and soup. We talked about what we needed to do with our rubbish to make our school more Eco-friendly. In our class floor book we explored recycling and how we should ensure that we throw rubbish away in the correct coloured bins so that it can be recycled and turned into a new product. We soon realised that some things had to go in our black bin as they couldn’t be reused! We researched what happened to some of these things and were astonished to find out that often rubbish ends up in huge landfills! What an ugly mess they were! Year 3B then found out that some things can be ‘upcycled’. Upcycling is when something is made into another product. We used the laptops to research upcycling and found out that lots of different things could be upcycled e.g. crates into chairs, and even water bottles into bird feeders! We designed our own upcycled products and collected some ‘rubbish’ together. We then made classroom equipment to store our pens, pencils and stationery using old tin cans and kitchen roll tubes. Look at our fantastic upcycled products… we are using them in our classroom too! This week we have also been on a visit to Low Hall Woods – luckily the sun was shining throughout our walk! We discovered lots of different living things including swans, sparrows and even a heron camouflaged hunting for its prey at the side of the lake. We explored different plants and trees using a classification key – we managed to spot and identify oak trees, elm trees and bulrushes too. April has seen Y3B begin their sessions with the School of Military. In our first session we met our instructor, Sam. He introduced himself and told us all about his life so far. We were fascinated to find out about his role in the Royal Air Force and the different countries he had visited when he was part of the Military. We were amazed at how brave he must have been in some situations he found himself in during his time in the military. We then introduced ourselves to Sam. We presented our likes, dislikes and information about ourselves. Everyone explained what they'd like to be when they grow up and leave school. I am so pleased to have so many future doctors, teachers, footballers, bus drivers in my class amongst many other interesting careers! Our next session with Sam found us learning all about the human body an how we need to keep it healthy so it can help us. We identified our five senses and how they are all linked to our central nervous system. We explored our reaction times by playing a simple catching game with our partners and were amazed that our reaction time increased with practise! We then went outside and developed our agility, speed and strength by playing different team games, running relay races and even having a go at a wheel barrow race. Miss Hindley joined in too! The children have had a very exciting week in Year 3B. To finish off their topic learning about Romans and Italy, they have been finding out all about traditional Italian food. We began by looking at different types of Italian food like lasagne, pasta, pizza and risotto. We shared our different dishes with other classes and asked them which their favourites were. We tallied their votes and then presented our data in pictograms. We found out that the most popular dish was pizza as it had the most votes! We designed our own pizzas and tasted different toppings to help us work out what would be the most delicious! We made our own dough using flour, and milk and had to knead, roll and spread the dough out into a circular pizza base shape. We then followed a recipe to make our own tasty pizzas. If you want to make your own delicious pizza for home, then why not read our recipes to help you? We have remembered to organise our recipes using time adverbs (first, next, after that, before), numbering and also subheadings to make them easy to read and follow too! What a scrumptious, exciting week we had! This term we have had a new Science topic called 'Rocks and Soil'. The children have enjoyed finding out all about different types of rocks and grouping them by their properties. We have carried out lots of different investigations to find out which rocks are permeable (let water pass through them) and which are impermeable (don't let water soak through). We also tested the density of different rocks by timing how quickly different rocks sank in water. We were amazed at how many different types of rocks there are and the different uses of rocks in our school and homes. We found that granite is used for worktops in kitchens, slate is used for a roof on a house and chalk is used everyday in Reception to write and draw on the playground! We even made our own rocks! We added white and milk chocolate to a cup and applied pressure to push them together. When we lifted the chocolate 'rock' out of the cup we noticed that the chocolate has squashed together into layers. This is just like a sedimentary rock which forms when new sediment presses all the water out of existing rocks causing layers to form over millions of years! This term we are learning all about the Romans and the country of Italy. On Thursday we had a very exciting visitor - a real roman officer! He told us all about life in the roman army. We found out about the uniform that soldiers would have to wear and were amazed at how heavy the armour was! We learnt some of the names for the different items in Latin. Did you know that they wore a tunica (tunic), had a cassis (helmet), and a scutum (shield)? We even got to dress up in the armour and try on his helmet! He also showed us the weapons that the soldiers used. We went in the hall after break to practice roman army drills. We listened carefully to instructions and commands in Latin and responded to them quickly. We had to march and lift our shields ready for battle. 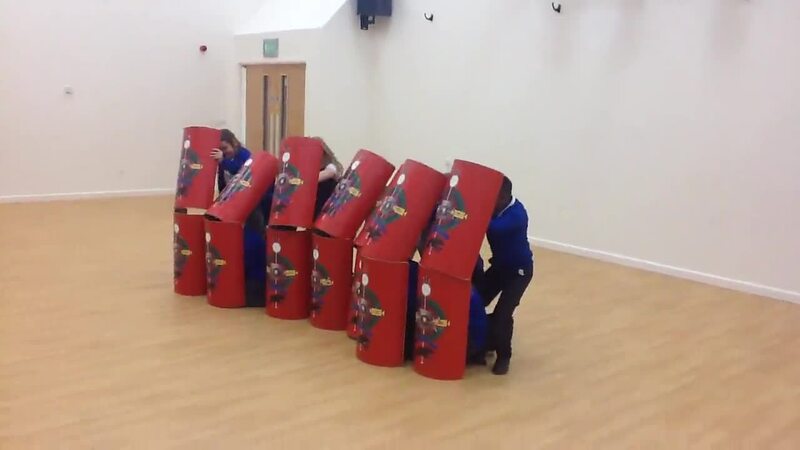 When the command was given we had to lift our shields up and over our heads to create a 'testudo' formation which means tortoise. It is called the tortoise formation because it creates a hard shell over the army's heads to protect them from the enemy's weapons. We managed to get our formation time down to 1.53 seconds - almost the blink of an eye! We are looking forward to finding out more about the Romans and how they invaded Britain and affected our lives today. We have been getting into the festive spirit this week in Year 3B. We had fun decorating our tree in class and also had a fantastic time watching a pantomime. We screamed and shouted at the baddies and thought it was hilarious! In Year 3b we have been reading The Worst Witch. We found a letter in class from one of the characters, Mildred Hubble, who told us she had ran away from Miss Cackle's Academy! We have been helping find her by writing our own lost posters and creating our own news reports. By interviewing her friends, we found out that she is terrible at spells, so we have been mixing our own potions and writing our own spell books to send to her. It was all going great until.... our potions bubbled up and exploded! A warm welcome to Year 3B. We have had a very exciting start to the year with our topic, "Chocolate: trick or treat?". The children were very enthusiastic about their first learning challenge of tasting different types of chocolate and sweets. They have already worked extremely hard thinking of amazing adjectives to describe the chocolates and to write their own acrostic poems. Eco week began when we planted seeds, flowers and vegetables for our school allotment. We also used the time to learn about recycling, road and water safety. This week, year 3 got together to take advantage of the lovely weather and have an outdoor adventure learning day. Throughout the day, we took part in lots of fun activities and learned about friendship, respect and teamwork. We took part in different activities including orienteering, crossing a maze, guiding sheep into a pen (blindfold game) and created an obstacle course for our teams to cross. To protect us from the mid-day sun, we put up our own tents to act as sun shelters. We had a wonderful day and, for once, it didn’t rain!